October is almost here and that means we’ll be hearing a lot about fall foliage. Take a look around. Some leaves are already showing their fall colors. You’ll also need to keep an eye on your lawn. The same leaves that look beautiful on trees can have a nasty effect on your lawn. Raking leaves is another fall tradition and a way to keep your lawn healthy. So what are the benefits to removing leaves from our yard? Lawns need to breathe. All those leaves can smother your grass, especially if they stay on the lawn all winter. Wet, untouched leaves can also cause your lawn to become a breeding ground for fungi and insects, something to consider if kids or pets are going to be playing in the yard. The importance of getting leaves off your yard can also depend on where you live. Many areas of the northern U.S. have cool grass seasons. These are times of the year when temperatures are neither too hot nor too cold. Fall is one of these times. It’s also a time of year where there is still adequate sunlight so if the grass has enough water and nutrients, your lawn will have a chance to revitalize itself. Of course, if you don’t remove the leaves, your lawn cannot take full advantage of the sunlight. You've got choices when it comes to removing the leaves. Leaf blowers are an option, but they may not be as thorough as the trusty old garden rake. 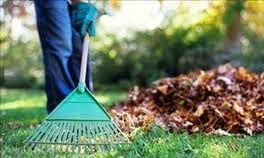 Raking and bagging leaves is environmentally friendly and a lot quieter than a leaf blower. Lawn mowing can also help with leaf removal. Your mower can mulch some of those leaves. You can also save some of your leaves to be used as compost in a garden. Once the leaves are out of the way, don’t forget about watering your lawn. Just because temperatures have cooled off does not mean your grass couldn't use water, especially after a few warm autumn days.